A Group Piano/Keyboard Instruction for 4, 5, and 6 year old children, incorporating music and movement activities. · Willing to sing, dance, and play along in a group setting. Program Time: This program meets for 13 weeks During each season. or call Jim Marone at (856) 691-6611. 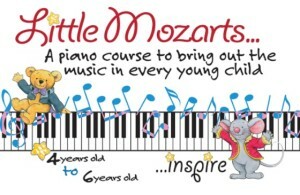 Music for Little Mozarts was written to provide appropriate piano instruction for four-, five-, and six-year old students while simultaneously developing listening skills. The series was designed to provide a balance between the discipline necessary for playing the instrument and the enjoyment one gets from the process of music-making while catering to their energy level. The course centers around the story of Beethoven Bear and Mozart Mouse as they learn about music. How many levels are contained in Music for Little Mozarts? What materials are included in each level? The time required for completion of each of the four levels will vary from class to class. On average, each level can be completed in 18-22 weeks. Three books at each level guide children through a comprehensive approach to musical learning. The Music Lesson Books introduce musical concepts and contain keyboard performance music. The Music Workbooks include coloring and ear training activities to reinforce musical concepts. The Music Discovery Books feature singing, listening, music appreciation, movement and rhythm activities. Other materials at each level include compact disc recordings, interactive Music Tutoring disks, magnetic note/dry erase board, and stuffed animals-Beethoven Bear and Mozart Mouse. What will my child learn in the course? Music for Little Mozarts combines general musicianship activities with those that develop performance skills at the piano. Skills taught in the course focus on keyboard performance, listening, pitch matching, keyboard technique, singing, rhythm, movement and music appreciation. Children will play pieces at the piano throughout each level. What is my role as a parent in music study? Parents play a very important role in music lessons for young children. Lessons are a total partnership between the child and the parents. Parents are required to participate at the end of class and share in the learning process at home. Parents must supervise practice and read directions to the student. In addition to practice sessions at the piano, parents should discuss the pictures in the books with the child, read the story in the Music Lesson Book to him/her, and listen to the compact discs together as a family. Should my child study privately or in a group? What types of things can I expect to happen in the lesson? Each lesson will include a variety of activities chosen from keyboard performance, singing, music appreciation, coloring, movement, activities with magnetic/dry erase board, listening and rhythm activities. The activities that occur in the lesson are structured to take into consideration the young child’s small hands and limited attention span. How often and how long should my child practice? After each lesson, your child will get an assignment for the week. Children should practice daily for 10-15 minutes using their Music Tutoring disk as an “in-between-lessons practice partner” at a specific time with no interference from the TV, computer or other family members. It is wise to practice as early in the day as possible, keep a record of practice time and establish a reward system for effective practice. Two brief practice times are preferable to one longer session. The parent should sit near the child during the practice time so that the child doesn’t feel isolated. How often should my child listen to the compact discs? How often should my child use the Music Tutoring disks? Students and parents should listen to the compact discs on a daily basis. Some days you will listen to specific examples from the child’s assignment. Other days you should simply listen to the entire CD as background music. Children absorb the music on the CD and it will motivate them to excel in music study. Children should use the Music Tutoring disk at each practice session since it provides a correct model for the child each time they play. What is unique about Music for Little Mozarts? The entire Music for Little Mozarts series was designed to develop creativity in the young child. The story of Beethoven Bear and Mozart Mouse continues through the entire series and the use of the stuffed animals in the actual piano instruction brings the story to life. The integration of the three books and the other materials is necessary to gain the most from the course. The Music Discovery Books offer the most opportunities for self-expression. These books move beyond piano performance through materials for singing, listening, music appreciation, movement, and rhythm activities. Unlike other courses that focus entirely on keyboard performance activities (often beyond the natural technical skills and musical understanding of the child), Music for Little Mozarts offers a variety of activities to lay the foundation for a lifetime of musical enjoyment. What type of instrument do I need before my child can begin piano lessons? Statistics overwhelmingly support the fact that students’ motivation is much higher and progress is faster when they practice on an adequate instrument; therefore, our program requires that students must have a digital or acoustic piano with 88 keys and a hammer action for home practice. M & M Music has keyboard recommendations, which may be special, ordered at a discounted price for our new students. Please speak to our sales associates about keyboard pricing.